The Indian Medicine Shows, composed of the plays The Moon and Dead Indians and Angel of the Medicine Show, traces the journey one young settler makes to and across the spiritual divide of American frontier. In the first play, a mysterious stranger (modeled after Billy the Kid) arrives at a farmhouse in the foothills, bringing music and unwelcome memories to a lonely widow and her son. In the second play, the performers in a medicine show, including an Indian, get run out of town and are left to search for healing and safety in the wilderness. The New Mexico territory of these syphilitic westerns is haunted by the ghosts of Indians, anguished desire and failed dreams. 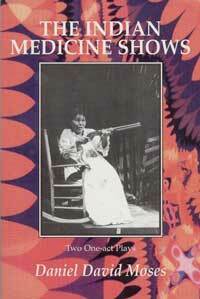 The Globe and Mail’s Top 10 Theatre productions awarded #7 to The Indian Medicine Shows (Theatre Passe Muraille) in 1996. Excerpt from The Moon and Dead Indians. Excerpt from Angel of The Medicine Show.